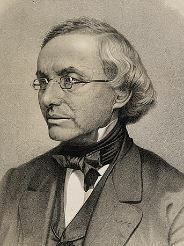 Isaac Leeser (1806-1868) was born in the Germanic kingdom of Westphalia. Growing up, he received both a religious Jewish education, as well as a secular German one, and was fluent in Latin, German, and Hebrew. He immigrated to the United States at the young age of 17 and lived with his wealthy uncle. While working in his uncle’s business, Leeser started to teach Judaism in his local synagogue, and vocally defended his religion when it was under attack in the public sphere. By age 22, he was quite well known, and was invited to take over Philadelphia’s Congregation Mikveh Israel, one of America’s oldest Sephardic synagogues. Leeser introduced American Jewry to the German custom of delivering a sermon between prayers (something now common in all synagogues). He wrote a book about Judaism in 1829 but found no publisher willing to print it. So, he started his own press, establishing the Jewish Publication Society. In 1845, he published his English translation of the Torah – the first by a Jew. Eight years later, he published a complete English Tanakh. This translation was the authoritative Jewish version for decades, and is still widely used today. Leeser helped found some of America’s first Jewish schools, seminaries, and magazines. He was also a civil rights activist and worked hard on behalf of all minorities. He is regarded as one of America’s most important Jewish pioneers. In 1840, Leeser met a wealthy farmer named Warder Cresson (1798-1860). Cresson was a very religious Quaker, a preacher and writer. 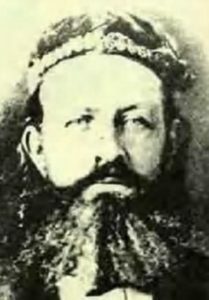 After some discussions with Leeser, Cresson took a deep interest in Judaism. In 1844, he was appointed America’s first consul in Jerusalem. This brought him face-to-face with Judaism and he grew close to Jerusalem’s ancient Sephardic community. He started writing for Leeser’s magazine, The Occident, and even began doing counter-missionary work to stop Christian proselytizing of Jews. In 1848, Cresson converted to Judaism, was circumcised, and took on the Hebrew name Michael Boaz Israel ben Avraham. Upon his return to Philadelphia, his wife divorced him, sued him, and sought to have him declared insane. The case made headlines across the US. Cresson ultimately won the suit, proving his absolute sanity and wisdom. He returned to Jerusalem, married a Sephardic woman and had three kids. In 1852, he established a Jewish agricultural colony – predating the Zionist movement by several decades, and in fact, helping to inspire it. He continued writing on Jewish topics, and died as a respected and prominent leader in Israel’s Sephardic community. His original tomb and burial place on the Mount of Olives was recently rediscovered. Just as the olive yields oil for light only when it is pounded, so are man’s greatest potentials realized only under the pressure of adversity. This entry was posted in Law, Politics & Military, Religious Leaders, Writers & Thinkers and tagged American Jews, Consul, Convert, German Jews, Immigrants, Jerusalem, Jewish Publication Society, Mikveh Israel, Philadelphia, Proto-Zionist, Quaker, Sephardic Jews, Tanakh, The Occident, Torah on November 24, 2016 by Jew of the Week. Henrietta Szold (1860-1945) was born in Baltimore, the eldest of eight daughters. After finishing high school, she became a teacher, and while working at both an all-girls school and a Jewish school, she was also taking additional studies at Johns Hopkins University. Soon, she opened up her own night school to assist Russian-Jewish immigrants and teach them English. After some 15 years as a teacher, Szold became the first editor of the Jewish Publication Society (famous for its JPS Tanakh, and now the oldest non-profit publisher of Jewish literature in English). 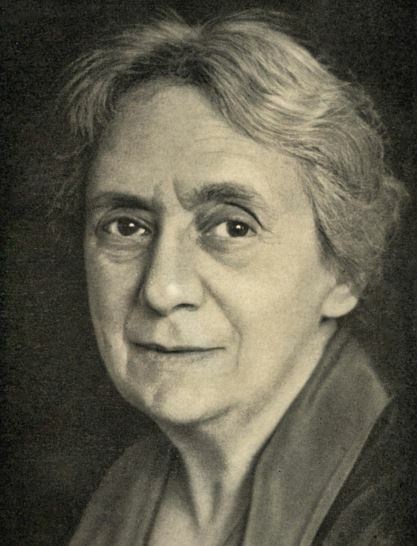 Over the next 23 years at this position, she translated multiple Hebrew books into English, edited many others, wrote countless articles, and helped to produce the popular Jewish Encyclopedia, as well as Marcus Jastrow’s well-known Talmudic Dictionary. Meanwhile, Szold pursued advanced studies at the Jewish Theological Seminary (America’s leading Conservative Jewish academy). At the time, these studies were reserved only for men, but Szold managed to persuade the school president to let her in. In 1898, she was elected to the executive committee of the Federation of American Zionists, the first woman on the board. Her devotion to Zionism became even greater when she took her first trip to Israel in 1909. Three years later, she founded Hadassah, an organization that worked to establish a proper health care system in Israel – for both Jews and Arabs. Under Szold’s leadership, Hadassah helped to create some of Israel’s very first dental clinics, maternity clinics, food banks, medical schools, nursing programs, and at least half a dozen hospitals (Jerusalem’s Hadassah Medical Centre is still one of the largest hospitals in Israel). Today, Hadassah, or the Women’s Zionist Organization of America, is one of the largest volunteer organizations in the world, with over 330,000 active members serving to support health education, women’s rights, freedom of religion, and the State of Israel. Among her many other accomplishments, Szold co-founded the Ihud political party, and played a key role in Youth Aliyah, an organization that rescued over 30,000 Jewish children from the Nazis. Today, many institutions are named after her (including a public school in Manhattan), and Israelis celebrate Mother’s Day on her yahrzeit, the 30th of Shevat. Szold passed away in the Jerusalem hospital she helped to found, and was buried in the nearby Mount of Olives. She was recently inducted into America’s National Women’s Hall of Fame. … there is no ending that is not a beginning. This entry was posted in Extraordinary Individuals, Writers & Thinkers and tagged Baltimore, Hadassah, Hadassah Medical Centre, Hebrew, Israel, Jerusalem, Jewish Encyclopedia, Jewish Publication Society, Jewish Theological Seminary, Johns Hopkins University, JPS Tanakh, Manhattan, Mount of Olives, National Women's Hall of Fame, Teacher, Volunteer, Women's Zionist Organization of America, Youth Aliyah, Zionism, Zionist on March 9, 2016 by Jew of the Week.